For our 2017 special gift to subscribers we're bringing together 1987 and 2017, in a unique limited edition collection of four 10" vinyl records. On the A side of each disc you’ll find the remastered original studio track, while the B side features a live performance of the same track from The Joshua Tree Tour 2017. 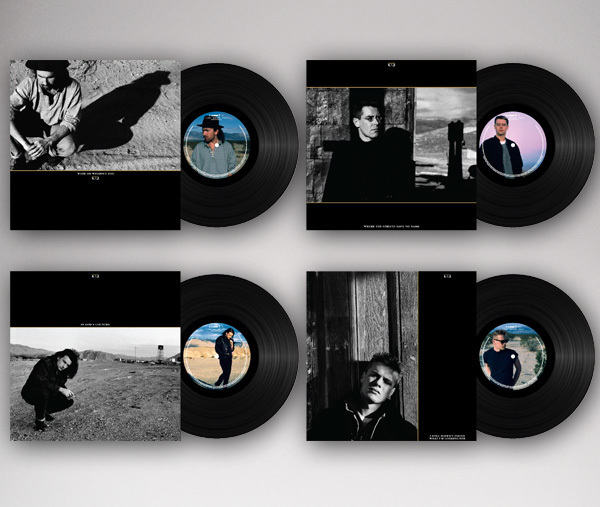 The label of each vinyl features previously unseen colour portraits by Anton Corbijn and the discs come in a sleeve capturing the original band member portrait from the 7" single cover, backed by a brand new live image from the 2017 shows! As usual, nobody else will have a copy of this one-off vinyl collection and it won't be for sale online or in store. It's produced just for our subscribers. In the next few months, you'll be able to download all the tracks. We're anticipating physical delivery of the four-disc set from September. In a year that a special edition of The Joshua Tree celebrates its 30th anniversary, this is a unique companion piece…available only to our subscribers.